We recently were given the opportunity to frame an old map of the Hot Springs Cemetery (the Hot Springs Cemetery in Truth or Consequences New Mexico, that is, at 9th and Cedar in T or C). We were honored to be involved in showcasing an important piece of local history. It was framed when it came in, not professionally – wish I’d gotten a photo – but in what appeared to be hand-cut pine moulding, painted. Parts of the map had been wrapped around the thick soffet-board backing, tucked out of sight and stapled. The frame had been painted at least once and probably twice while the map was installed (with no glass to protect it). Andrew had a heck of a time getting the map out of frame in one piece. The old frame needed to be preserved as well, so that it can go back to City Hall, this time framing a copy of the cemetery map. 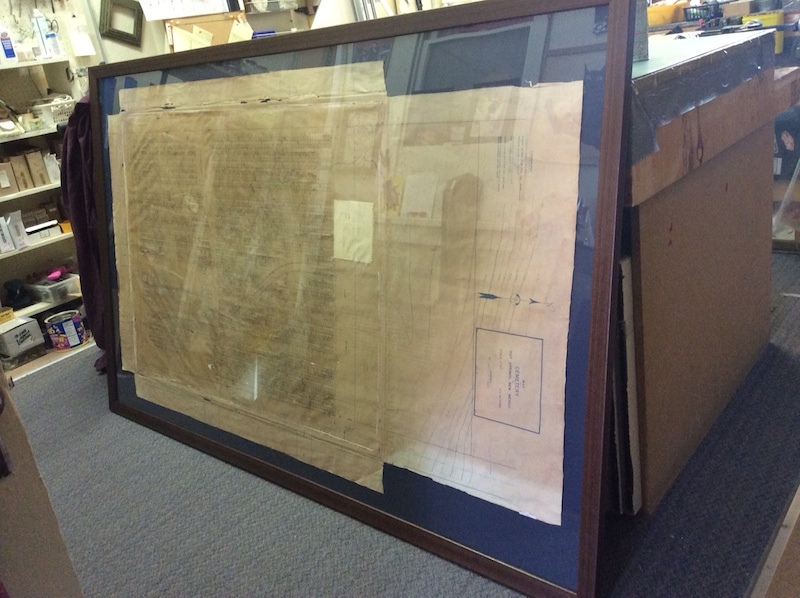 Once it was laid out and measured, we enlisted the help of a man who has no doubt framed 1 or 2 oversized vintage maps in his day, the one and only Ron Saltzman at Frame & Art Center in Las Cruces. Ron has generously given us advice and assistance over the years, and he was the first to suggest it should be displayed in all its tattered glory rather than folding or trimming the edges. The client (Hot Springs Cemetery Association) agreed to this plan, never mind the fact that in framing, bigger dimensions always equate to bigger ticket price. We solidified the mat / moulding plan and ordered materials, and then I got busy worrying about if we were doing the right thing. A few days later, oh happy day. 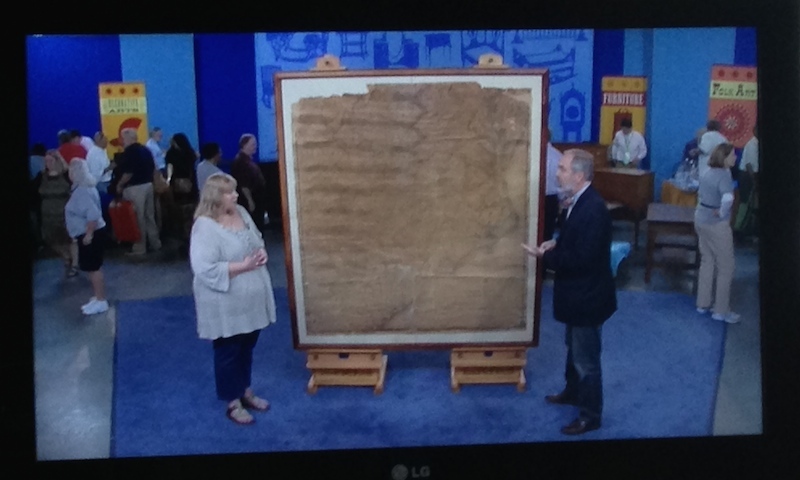 A vintage map was featured on The Antiques Roadshow. I always keep an eye out for picture frames on the Roadshow. It’s a fine way to get new ideas, or to be reminded of old classic ones. Or to rule out bad ones. It also reinforces the notion that we should be pushing UV-protective glass on almost every customer. But that’s another blog post. The old map shown on the Roadshow had its rough edges showing, and the assessor didn’t reprimand the owner for the frame job (if you watch the Roadshow you know it can happen!). Here’s the finished framed Hot Springs Cemetery Map. It hung previously, in the old painted frame, at landscape orientation, but if there’s room, we’re hoping it will go on the wall the way it’s currently wired – with the title at the top. Regardless of how it’s hung, it will soon be installed and on view at the Geronimo Springs Museum on Main in Truth or Consequences.